* Children like to run and running is fun. * Running can be a healthy, life-long activity. * There is excitement from the competitive aspect of the sport. 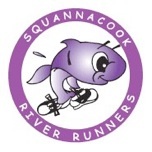 Squannacook River Runners register each participate with a state coordinator. A local meet is held, and may include a number of town's together to provide more efficiency, excitement and competitiveness. Each town then submits the best performance of each of their children to the state coordinator. Thus, one does not have to win the local, multi-town meet; one only has to have the best performance for one's town. It is not the intent of the Hershey Program to establish a winners only contest. The state coordinator determines the top 16 performances by town, and those children are invited to participate in the state meet in July in Bolton. If a child cannot participate on the date in July, then that child's town may find a replacement from among its other participants. The state winners are eligible to be selected to participate in the national Hershey Track meet in Aug. A geographic distribution rule that states that each state must have five participants in the national meet does not guarantee that a state winner will go to the national meet. One may enter only one local meet. * Track meets are long affairs, and because there is no required pre-registration for the local meets, there is no way for the meet organizers to predict the number of heats of each race that will be run. With 30 different running events to be held, it can take a long time. Your child should not plan on doing other/multiple activities within the time frame of the track meet; especially if they are the member of a relay team. * A participant may compete in 2 running and one field event, or one running and both field events. Being a member of a relay team counts as one of the participant's running events.